As the holidays near, you might be freaking out about what to give. If you're not quite sure how to please the person on your list, why not go for a makeup palette? The variety of colors, textures and products within each of the palettes featured below are guaranteed to put a smile on your recipients' faces this holiday season. 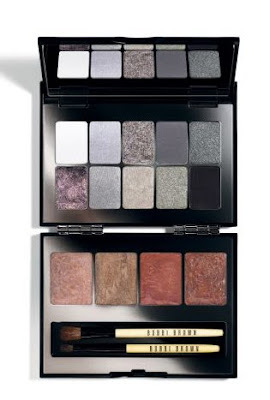 Bobbi Brown Chrome Palette ($75): I haven't been able to find one negative thing to say about this palette since I first started using it. 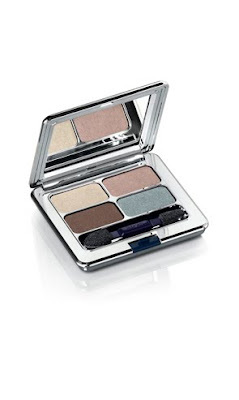 An amazing array of eyeshadows and lipcolors await in the beautiful, gleaming silver compact. I love the hinged trifold design, which ensures that the colors don't bleed onto one another. You'll find 10 eyeshadows in Bobbi's various washes and finishes (White, Polar Ice, Storm Cloud, Iron, Thunder, Moonlight, Cyber Grey, Foil, Chrome, Charcoal Haze) and four lipcolors (Pink Mist, Winter Bronze, Berry, Chrome Pink), all which cast a gorgeous iridescent shimmer on the face. La Prairie Cellular Treatment Eye Colour Ensemble in Les Doves ($70): Give the gift of luxury this season with La Prairie. Four shimmery eyeshadows (taupe, charcoal, chocolate brown and cocoa) rest within a gorgeous lacquered silver compact with an intricate raised embossed design across the front. It even is presented within a plush velvet case, so wrapping becomes completely unnecessary. 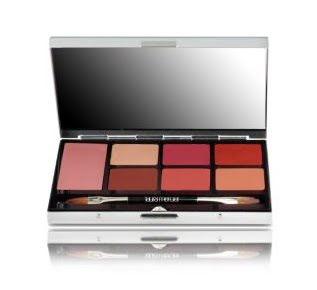 Laura Mercier Lip Watercolours in Fair ($48): Another prettier-than-pretty palette, this time from Laura Mercier. Six lip stains, along with Lip Prep (a moisturizing, translucent primer to help each color stick) sit ever so elegantly inside the oversized silver compact. Each is designed to be applied with the fingertips, though those ladies who prefer to apply with a brush have that option with the inclusion of a dual-ended miniature brush. The Fair kit includes coordinating colors of juicy peach, coral raspberry and chocolate brown.